In many areas of creative sound work pictures are a headache. Even in the media age, the provision of off-line pictures to work to is still a problem. Of course, it can be achieved, but often the cost is disproportionate. If a project is shot on film, these days it will almost inevitably be edited on a non-linear system. If video, it may be edited on tape or more likely non-linear with a tape conform. Whatever the editing process, there is a frequent requirement to look at the picture while recording or mixing sound. It is clearly undesirable to use a master videotape as a working picture. The tape is subject to unnecessary wear and the machines to play it are hugely expensive. The alternative of using a U-matic or Betacam offline copy still requires expensive and high maintenance VCRs. Besides which, random access to pictures is highly desirable. The alternatives which can achieve this, are either bring the non-linear editing system into the sound studio, which can be inconvenient and expensive, or use a dedicated non-linear video recorder/player. Dedicated video players based around magneto-optical and or hard disks have been around for a few years but have failed to really take off since the machines are still relatively expensive and you really need at least two, one for transfers and one in the studio. CB electronics well known in sound for picture circles for their synchronising solutions believe they have developed a workmanlike and cost effective solution to the problem. DVD has taken off quicker than any previous consumer format. DVD recorders have fallen in price to the same point as a decent VCR and blank write once disks are now the same price or less than a VHS cassette. DVD carries an absolute time code (frame count) within the data so, if a way could be found to synchronise a DVD player this might provide the answer. The first requirement is a controllable DVD player. The Pioneer DVD-V7300D just about fits the bill. 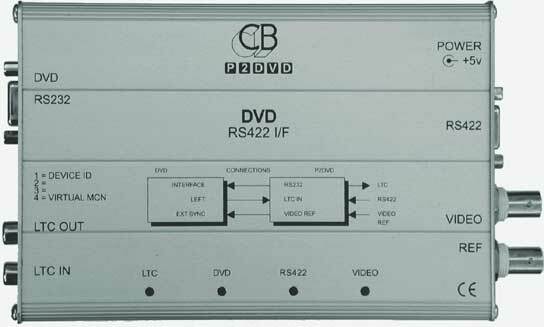 An affordable industrial player which can be locked to external video syncs and controlled by an RS232 serial protocol. Controlling a mechanical transport, tape or disc, has always presented problems. Even where there are so-called standards these are open to interpretation and vary widely. Then there are transport ballistics to consider and the foibles inherent in electro-mechanical devices. CB electronics have vast experience in this murky world of machine control. For this application they have designed a compact interface module which allows the player to appear as a controllable 9-pin (Sony P2 protocol RS422) master to most RS422 synchronisers, DAWs and Console automation systems. In fact the device ID can be set to native P2DVD or Sony BVU-950 emulation. Laudable though this is, there's a bit more too it than simply remote controlling the machine. If the DVD is to be locked to other equipment at a specific time there has to be a time-code element. In fact CB have allowed for two possibillities - the use of one audio track continuously striped with time-code or, where both audio tracks are in use, a single burst of code at the start of a recording. (Before the programme start) In either case, the code is used to establish an offset between DVD's absolute time frame count and the time-code output from the P2DVD. As always, for prospective users, process methodology, performance and cost are the salient issues. Any DVD-R recorder can be used to produce the disks. Domestic models are rapidly falling in price and are perfectly adequate for the job. A suitable transfer set-up will incorporate a switched feed to audio channel 1 between audio and the time-code output of the play machine. This enables a burst of code to be conveniently recorded before switching to audio source. Up to 9 'titles' per DVD-R are catered for, useful for commercials and promos. Once properly set up, operation is straightforward. Locating to 00.00.00.01 to 09 takes you to the start of each title. Locating to 00.00.00.00 goes to the title page with all the titles listed. If a time-code burst is present at the beginning of the title P2DVD uses this to establish the relationship between DVD frame count and time-code. CB Electronics include a phono 'Y' lead to split one of the audio outputs in order to feed code to the unit. Once the position is established P2DVD appears to other equipment as a 'normal' P2 master. If there is no time-code on the disk, a SET GENERATOR command can be used to set the time-code to any valid value. There are a few limitations. The disks must be kept scrupulously clean if problems are to be avoided and jog performance is limited by the physical constraints of the player. Tthere is no audio output in jog. Reverse play is fine, locates take around a second but jog is limited to 1/25th play speed to 10 X play speed and there is a pause between 1/2 and 1X play while the player re-loads its buffers. The player stops on the first field when jogging backwards and the second when jogging forwards or locating. If BITC (burnt in time-code is recorded one field late it will appear as if the DVD loses a frame on direction changes. Both the recorders and players are dual standard PAL/NTSC. Overall, the dynamics are better than tape but not as good as hard disk. The key advantages are the sheer convenience and low cost of the media, the relatively low cost of the machines, high quality pictures and low maintenance. While this may be an interim solution there is an undeniable attraction in the low cost and portability of the media. However, owners of intellectual copyright may perceive this as a threat. P2DVD is already in use at a number of locations and at least one major film has been mixed using the process.